Before Toronto debates its 10 year bike plan next month, here are some suspect arguments to watch out for. City council’s approval of a pilot bike lane on Bloor is a long-awaited victory for Toronto’s cycling fanatics. 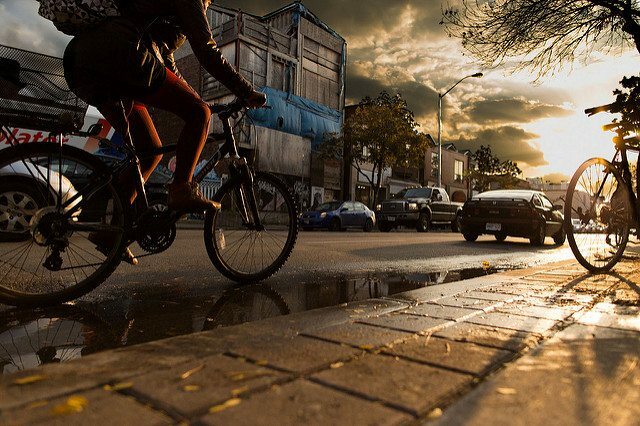 Come August (assuming everything goes as planned), bike lanes will run between Shaw and Avenue, making for a smoother ride across the Annex-Bloor area. But Council’s deliberations on the pilot project showed that some underlying myths about bike lanes are persistent. While the pilot project passed this time, those arguments could find renewed traction in upcoming decisions, and speak to the city’s difficult and frustrating discourse about cycling infrastructure. In light of upcoming cycling matters—namely, a 10-year plan aimed at identifying and implementing 525 kilometres worth of bike lanes across the city—council support could very well change. With this in mind, here are a few common misconceptions about bike lanes, and, more importantly, why they’re misconceptions. Needless to say, switching transportation modes from cars to bikes is difficult, especially for Torontonians commuting from the suburbs. A bike ride could take hours, and public transportation can be notoriously bad once you’re outside of the subway and streetcar network. As such, driving becomes the one visibly convenient option for long-distance commuters. This was the gist of city councilor Stephen Holyday’s (Ward 3, Etobicoke Centre) argument during council’s meeting on May 4. The argument goes that by adding yet another bike lane along an east-west arterial road (the others are situated along Davenport, College, Harbord, and Barton) the new bike lane would increase congestion along these roads, essentially “blocking off the people of the west end” who have no clear option other than driving. The myth here is that cycling infrastructure will cause congestion to the point of excessive traffic delays. Bike lanes don’t always add to traffic congestion, and really need to be analyzed on a case by case basis. Except for rush hour, Bloor Street is already occupied by parking spaces on either side of the road, and, in turn, narrows a four-lane street down to two lanes. Bike lanes will remove parking spaces, sure, but in turn will leave the two-lane situation in the same condition it was prior to the installation of the bike lanes. If bike lanes do in fact cause minor inconveniences, these inconveniences are nothing in comparison to on-street parking used practically around the clock. Here’s an 808 page book on why that’s bad public policy. Although Holyday cited four other east-west roads with bike lanes that supposedly block off suburban commuters, he ignored bike lane-free Dupont Street and Dundas Street, not to mention the most popular thoroughfare for commuting suburbanites: the Gardiner expressway. Bicycles cause climate change. This claim has been brought up on a number of occasions, and, instinctively, sounds counterintuitive. If cars = pollution, and bikes = less pollution, how are bike lanes worse for the environment than any given road designated for gas guzzling motor vehicles? The justification for this argument appears to be that bike lanes will increase congestion on arterial roads, to the point where cars are left to idle in traffic and slowly hack away at our biosphere. A thought-provoking assertion at best, this claim boldly misidentifies the real environmental hazard. In 2012, Ontario’s transportation sector comprised 34 per cent of the province’s greenhouse gas emissions. As of now, according to environmental lawyer and founder of Bells on Bloor Albert Koehl, emissions from the transportation sector soar nearly as high as Alberta’s tar sands. So, never mind potential congestion levels: Ontario already has an established emission problem, and over a third of it is a result of motorized vehicles. Bike lanes, meanwhile, are intended to help reduce this emission problem by encouraging cycling as an environmentally friendly alternative to driving. Rather than preventing the implementation of bike lanes to avoid congestion, the onus should be on environmentally conscious drivers to consider alternative modes of transportation instead. “The thing that drives people crazy, is that they’re sitting in traffic in the middle of January, and they’re moving at a snail’s pace…and then there’s this bike lane next to them that’s completely empty.” These were the words of Deputy Mayor Denzil Minnan-Wong (Ward 34, Don Valley East) at the May 4 council meeting. Minnan-Wong voiced support for the pilot, but moved to have it evaluated in the dead of winter. The motion is valid—it’s important to ensure that infrastructure on busy streets are being used year-round—but those opposed to cycling in general often emphasize the supposed abandonment of bike lanes during the winter. While it’s true that bike lanes are used less in winter than in summer, a City of Toronto cycling study [PDF] conducted between 1999 and 2009 reported that nearly a quarter of cyclists still bike during the winter, and that the majority of those winter cyclists use bike lanes for utilitarian purposes, such as getting to and from work. This is still a large number of people—especially when considering the city’s recent estimate that a majority of Torontonians cycle—and considering the safety risks cyclists face during the winter, those safety risks increase significantly without the necessary infrastructure. And besides, we ranked eighth (out of 1,587 cities) in this year’s International Winter Bike to Work Day—losing, somewhat devastatingly, to Zagreb, Croatia. Until next time, Zagreb. This article was made possible by Urbane Cyclist.